it was so easy – too easy – so traders got spooked and the currency lost 5.5% against the dollar bringing a two day loss to around 13% by mid-Wednesday. But Thursday’s announcement has done the trick and seems to have soothed feelings so it’s climbing steadily again. Now around 70 points from the weekly average and 100 from the monthly high traders are showing faith in the digital currency. We see 600 then 650 as key positions. In Europe the GBPUSD has run wild with Thursday’s interest rate announcements so we hope you cashed in as we predicted lots of fun after a week of doom and gloom in that market. Take a peak at this chart to see why traders were twitchy. Every single indicator has dropped below the crucial 50 mark and business confidence has tanked to a ball-aching -47. The Bank of England governor insists he won’t drop rates into the negative but seriously, let’s call it what it is, a recession. So what are the Brits going to do? Print more money? In any other industry that’s called fraud but with a pretty name everyone laps it up so look out for some quantitive easing as we predict the UK market isn’t on the up any time soon. And what does it mean for our traders – beautiful volatility and chances to make money on the way. So have some serious fun playing Bitcoin over the weekend and check back for Monday’s post to give you the big events that will shake the markets up next week. Whatever direction you think Bitcoin is going to go, you can learn to trade at no risk here at SparkProfit. You can even earn weekly cash rewards. Bitcoin has begun to make a serious of higher highs and higher lows and there could potentially be a bullish channel emerging – at least in the short term. Sellers have been defending the supply zone around $244 with price capped at this level over the last few weeks. The $255 price level looks interesting and there may be some supply there. Why? Previous supply form the start of April may be defended. Top of the short term channel. Multiple abcd patterns and equidistant swing completing into that zone may get the attention of the shorts. Close to the half way back level of the price move from the top of the bearish channel to the bottom made mid April. The half way back is a key psychological level watched by many market participants. 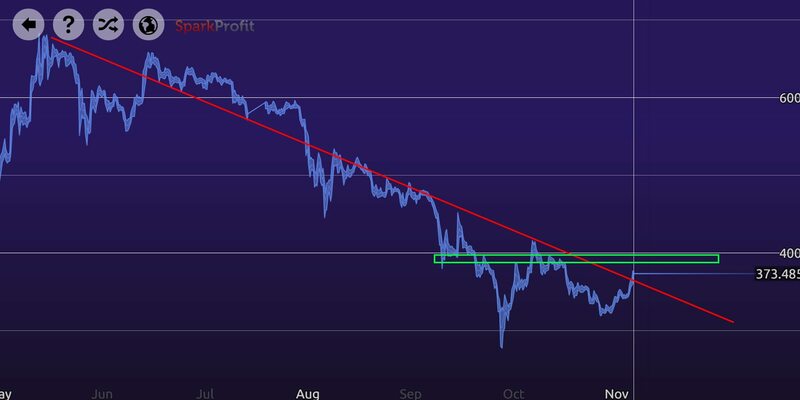 Bitcoin has been moving in a very tight range the last couple of days – this compression usually precedes a break out in this market. For now, the SparkProfit sentiment is to the long side indicating our players are bullish – but this could go any way! Which ever way you think Bitcoin is going to go, you can play Bitcoin risk free with SparkProfit. Its been a quiet week for Bitcoin with the cryptocurrency trading within last weeks range. 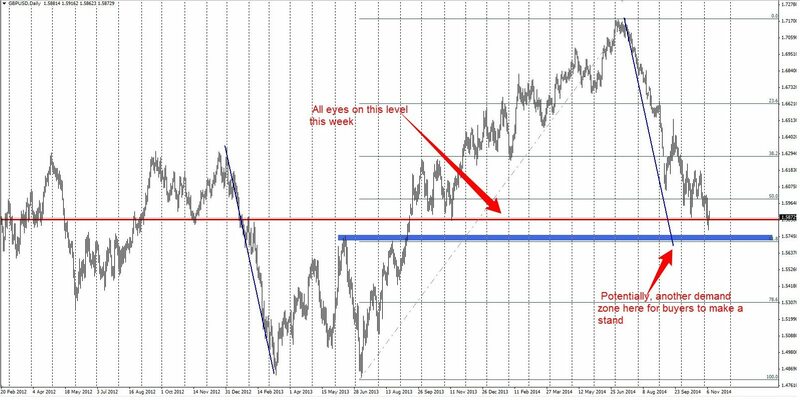 This week’s low was made at the half way back of last week’s range (always a level worth watching) and gains have been capped at last week’s high for now. Bitcoin found demand at the 50% retracement and previous resistance now turned support. Price has moved outside of the bearish channel indicating a potential change of sentiment. We have been making a series of higher lows and higher highs with a potential bullish sentiment channel forming. Bitcoin has been reacting off of levels defined by equidistant moves quite well indicating a move to 256 is well within reason. And, what does the crowd think? Spark Profits crowd sentiment indicator is showing a bullish bias based on the opinions of our players. What do the crowd think? There has been an increase in liquidity in Bitcoin over the last year with institutional traders and Hedge Funds starting to take an interest and trade in bitcoin. This week has also seen the opening in the United States of the first regulated Bitcoin exchange – this should encourage more institutional traders into this market. Coinbase launched in the UK last week and they are anticipating participation from larger traders and Hedge Funds. Bitcoin’s increase in liquidity has been reflected in SparkProfit and from this weekend, players can make three times the points they used to on Bitcoin games. Remember, Bitcoin is the only market that trades right through the weekend so you can log on anytime and try and earn some points. Bitcoin is making new highs for the week and is coming up against a potential sticky zone the bulls will need to clear. Whats Going On With Bitcoin This Week? Sweden’s Nasdaq exchange has approved a bitcoin-based exchange traded note. The worlds first formal Bitcoin exchange is likely to open in New York with news that New York State’s Department of Financial Services are going to publish a regulatory framework which will allow those who have applied to be a Bitcoin exchange to launch as a bank. Coinbase has launched its services in the UK this week. Coinbase will allow speculators trade bitcoin against Sterling. Coinbase are anticipating participation from hedge funds and institutional players over time. The Squid (Goldman Sachs) have invested $50 million into a Bitcoin start up which will use Bitcoin technology to improve consumer payments. Could we be seeing the start of a bullish move here? Its looking a bit sticky for Bitcoin at around $237. If the bulls can clear this level, its blue skies until about $257 where we have an equidistant swing into some previous supply. Brent Oil Futures Break Resistance. Will Brent Find Acceptance Here? Brent futures broke through a significant level last week and are presently trading at a potential demand level. The fundamentals and pundits are still screaming a further bear market on this but it might be worth looking at where price could potentially go to given the recent price action. The chart below shows a longer term view on Brent. We could have a potential ABCD pattern completing into the 69.50 area. This level is interesting as we have previous historic demand here from mid 2010 with the lows made where buyers came in (and old lows can become new highs). There is a strong bear candle from the start of December 2014 indicting some supply there a the time. Bitcoin – Will The Bears Reload? The lows have held last week on Bitcoin and we have seen some corrective price action with a potential ABCD pattern forming into some interesting price structure. Will we see selling on Bitcoin ? The recent lows/demand zone at around 234.50 may see some shorting here. The strongly bearish candle from the start of April has also tipped the hand of the bears. For now, the lows at 213 and the recent supply at 232 to 234.50 seem to be the levels to be aware of on this instrument. The bulls have it.. for now..
More upside for the Euro? Will Bitcoin Find Support Here Or Is There More Decline? We are trading at a significant previous demand level on Bitcoin with an equidistant swing completing into 212.80 level. It will be interesting to see if this bottom holds on retests. However, another correction could see further decline to where the January lows may give some support – buyers came in strongly at this previous resistance (now turned into support) level. For now, the 212.80 is attracting demand, if this should break and we get acceptance in price under this level, it will be interesting to see if the bears use this level to position short for a further leg down. There is also talk that some of the U.S’s biggest prop traders are “testing the waters for a bigger move in Bitcoin” according to the Wall Street Journal recently. Which ever way you think Bitcoin is going to go, you can play it risk free with SparkProfit. Weekly Wrap: all eyes on GBPUSD this week. Traders will be keeping an eye on the GBPUSD this week with the Bank of England inflation report coming out on Wednesday which may be very dovish putting more pressure on the pound sterling. 1.25 seems to be the line in the sand for the sellers with euro. This supply level held today at the intersection of the descending sentiment line and previous support (now resistance). Last week, sellers sold the open briefly before buyers stepped in. Mid week, sellers came in again and cracked the lows made at the open before closing back up near some intermediate resistance made during the week. The yearly lows looks at risk on this pair. The monthly bearish candles are longer in length and more determined compared to the bullish candles and we are back at the lows. Looking at the longer term chart, it is within the bounds of reason that we could see 0.80 on this instrument sometime in the second quarter of 2015. 0.80 on the cards for middle of next year? In the short term, 0.8640 is the level to watch. If price can hold above this level, buyers may push this pair to the recent supply zone of 0.8760 and the unfilled opening gap. This might be an area where shorts would consider re-loading. We are at a significant historical level with this pair and this week could be interesting with the BOE report out on Wednesday. Buyers have defended this level in the past and if sellers manage to break this level with any force, any subsequent retests of this level from below could be an opportunity for shorts to reload. All eyes will be on 1.5850 this week. Bitcoin is not immune to the dollar buying with the 400 level holding for now and a bearish sentiment line allowing sellers to define their risk. 400 the line in the sand for BTCUSD? Any commitment in price above 400 and retests of this level may see some buyers trying to reload to squeeze those shorts and punish any short sellers who are late to the game. If price remains below the sentiment line, the bears have the ball with Bitcoin for now. To find out what the crowd thinks of these markets – just click on the sentiment icon on the chart in Spark Profit to get the opinion of over 100000 players from around the world.